“The way in which the essay appropriates concepts is most easily comparable to the behavior of a man who is obliged, in a foreign country, to speak that country’s language instead of patching it together from its elements, as he did in school. He will read without a dictionary. If he has looked at the same word thirty times, in constantly changing contexts, he has a clearer grasp of it than he would if he looked up all the word’s meanings; meanings that are generally too narrow, considering they change depending on the context, and too vague in view of the nuances that the context establishes in every individual case”. The birth of criticism in a modern sense, dating back to the late 18th century, can be understood as an insurrection against the pretense of neoclassical poetics to establish a-historical criteria for the judgment of works. Instead of a priori rules for producing and evaluating artistic creations, the fathers of criticism (I particularly refer to Novalis and the Schlegel brothers) postulated that each work needs to be grasped in its own terms, based on an immanent analysis that should not succumb to the dogmatic temptation merely to issue judgments on its (good or bad) finish. Instead, such analysis should take up the responsibility of expanding its reach. From an allegedly impartial judge of the works of others, the critic is converted into a co-author of the works that he or she intends to approach. The task of the critic – analogously to the task of the artist – is then to propose new arrangements of the elements of a work, by exposing certain layers of meaning which, otherwise, would be left out of consideration as nonexistent. The vigor of these new arrangements is largely determined by the historical situation of the critic himself. In any work of criticism of critique, this task is not a matter of ascertaining whether the critic has found the occult and unchanging truth of a work – as Iser has shown in his brilliant analysis of Henry James’ novel The figure in the carpet, such a truth does not exist! (ISER, 1996, pp. 23-48). Instead, it is a matter of investigating to what extent the new reading proposed by the critic for an original work allows a glimpse of possible paths for dealing with the issues of the present. In Roland Barthes’ beautiful phrasing, “criticism is not an ‘homage’ to the truth of the past or to the truth of the ‘others’ – it is a construction of the intelligibility of our own time” (BARTHES, 2013, p. 163). On the one hand, this approximation between criticism and creation redefines the current social role of the critic, who ceases to be a guide for cultural consumers to become a partner of the artist in his or her attempt to cope with the precariousness of a language that is not satisfied to repeat any canonical standards. On the other, it exposes how much artists and, especially, theater directors, need to criticize the works that they intend to stage in their own work. If we can say that a critic always has something of an author, then an author has always something of a critic too. If the words above should remain only as a theoretic statement, they would not be more than a problematic generalization – just like any other generalization. However, in the specific case of theater, and in the even more specific case of contemporary interpretations of classical texts, it can become a privileged guiding thread for criticism. At every new interpretation of a classical work, I am obsessively haunted by questions such as: to what extent does this work say something new about its original point of departure? To what extent does it go beyond merely reproducing the plot that inspired it? To what extent does it reveal other layers of meaning of the original work, which, without this particular interpretation, I would not be capable of noticing? To what extent does it relate to the most pressing issues of the present? In short: to what extent is this theater piece an essay on the original work, beyond the attempt to reproduce it… uncritically? The proposal of Curitiba director Octavio Camargo is to bring Homer back to the contemporary repertoire, so that Homer’s poetry may once again be familiar, close, usual and popular, and no longer a classical, distant and somehow hieratical or erudite reality. To attain this objective, in 1999, Camargo conceived a literally Homeric enterprise: to stage the full 24 books of Homer’s Iliad with 24 actors – each of whom to become responsible for one book. Bearing in mind his esteem for the highly musical concreteness of Homer’s poetry, Camargo made the decision of using the translation of Manuel Odorico Mendes (1799-1864), considered by none less than Haroldo de Campos as “the patriarch of creative translation, or ‘trans-creation’, in Brazil” (CAMPOS in HOMERO, 1992, p. 11). 16 years after the birth of project Ilíadahomero, Camargo presented the 10 books of The Iliad he has already worked out during the recent Curitiba Festival. His goal is to prepare the full 24 books and stage them in Athens, Greece, simultaneously with the Olympic Games of Rio de Janeiro in 2016. This, by itself, ironically expresses a political position. 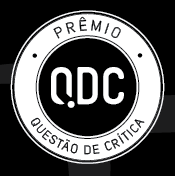 Considering that the work is not yet finished, the presentations during the Curitiba Festival were referred to by Camargo as a work “in process”. After my own failed attempt to read Odorico Mendes’ translation of The Iliad [and compared to Mendes’ text, the other two translations available in Portuguese language by Trajano Vieira and Haroldo de Campos – which are rightfully praised for their high poetical density – seem to be written in an almost colloquial style], I came to seriously doubt the possibility that it could be staged. Thus, the temptation to go see an enterprise that seemed to be fearfully comparable to those of Greek heroes such as Icarus or Niobe was simply irresistible. Yet, in the musty auditorium of the Curitiba Memorial, where I saw the staging of the 10 books, I actually had one of the most intense theatrical experiences of my life. Even though it is always quite difficult to express into words the rapture caused by a work of art or by a person we love, my goal is to understand some of the reasons for such rapture. As the reader has probably noticed, my strategy will be to show why this series of spectacles that I have seen materialized on stage one of the most interesting critical essays about Homer, and maybe about poetry in a broader sense, that I have ever accessed. In other words, a critical essay that, similarly to Carmelo Bene’s essays on Shakespeare, is a theatrical play. How are we to conceive of the relation between theatre and its criticism; between the original play and the derived play? As Baruch Spinoza once wrote, “Omnis determinatio est negatio”. If all definitions involve the task of delimiting the nature of an object based on what this object is not, then the first things that caught my attention in Octavio Camargo’s “adaptation” were that (1) he did not omit a single line of the original text; (2) he did not insert a single metalinguistic comment in his staging; (3) he did not abandon the primacy of Homer’s word, that is, he did not indulge in the fetishist temptation to produce autonomous images for the text (à la mode of the visual arts, video or dance); and, finally, (4) he did not attempt to simplify the original language, and did not flinch from the Herculean effort of uncompromisingly restoring us the complex fabric of Homer’s poetry. The uniqueness of Octavio Camargo’s Iliad stands out through these options, especially when one contrasts its staging to some recent adaptations of classical texts. At least since the 1990s, theater in Brazil experienced a deconstructivist boom of interpretations of drama classics, and even of works of the universal literature. In these plays – as seminal examples, I mention Ensaio.Hamlet and Gaivota: tema para um conto curto, both directed by Enrique Diaz –, the original texts were the starting point (1) for staging selected fragments of the source works without any commitment to their totality; (2) for countless meta-linguistic games among the actors, who would not tire to reflect on the difficulty of staging texts that are so distant in time, to denounce the theater-illusion and to propose possible contemporary interpretations for the ideas they brought to the scene as closer alternatives to the world of spectators; (3) for producing theater performances or even settings at the frontier of the visual arts with an expressive potential largely independent of the suggestions contained in their source texts; and, finally, (4) for updating the language of classical texts, in the attempt to make them more colloquial and more immediately accessible. 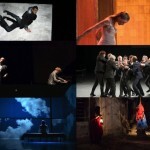 In all these options adopted by Diaz’ company (Companhia dos Atores) and many other companies that subsequently aped it, one could glance at an entire scenic thinking fed by a pulsating disquiet with forms, which attempted to make theater more lively, physical, surprising and contemporary. The declared enemy was the text-centered status of conventional drama. The two plays mentioned above had such a powerful effect that for a long period of time, they became canonic in their own right. On the one hand, they were luminous examples of how a play can be an essay on Shakespeare – as in the case of Ensaio.Hamlet, which brings this proposal in its title itself – or an essay on Chekhov – in the case of Gaivota: tema para um conto curto [Seagull: a theme for a short story], which subtitle acknowledges the abandonment of the modern idea of totality and takes a side that could be referred to as postmodern or post-dramatic. On the other, these stagings generated a “new wave of essayism in theater”, which fruits not always preserved their flavor. In the wake of these creators, spectators saw a flood of purely aestheticist stagings, in which the narcissistic delight of actors, the fetish for metalanguage, images and catchphrases, the excess of irony as a social substitute for intelligence (possibly taken from North American sitcoms) and the use of projections and snuggly objects tended to silence the ethical and political potential of theater. In dialectic terms, it is undisputable that such “new wave” enabled fruitful scenic inventions and formal discoveries. Not unfrequently, it also infused a new measure of involvement between the stage and the audience, which had been virtually lost by the more traditional forms of drama. However, one must also recognize that the abandonment of a more consistent exploration of the poetical, political and ideological reach of the original texts has frequently led to childish results. Irony, fickleness and the thirst for image to the detriment of the living word – which can be seen as features of a particular cult of adolescence – were followed by an inclination to describe any attempt of theater essay that would be more mature and more willing to confront the complexity of the classic works without resorting to simplified updates as tedious or outdated. This new type of essayism was put in practice by Octavio Camargo in his staging of The Iliad. The lines above already discussed what it is not; let us now describe what it is. Letting Homer’s word sound; believing that his music and imagery continue to be “audio-visible” to spectators of another time and place; believing in poetry’s potential to enchant and evoke the ancient spirit, and in the pedagogical power of its oral nature: these were the principles that enabled the staging of The Iliad in Curitiba. To support Homer’s word, the direction of the play opted for a minimalist scenario. Although with variations in the stagings of the ten books I have seen, actors would move subtly on an otherwise empty stage – only enough so their slight gestures and body movements could grant eloquence to the rhythmic variations of The Iliad’s meticulously recited poetry. 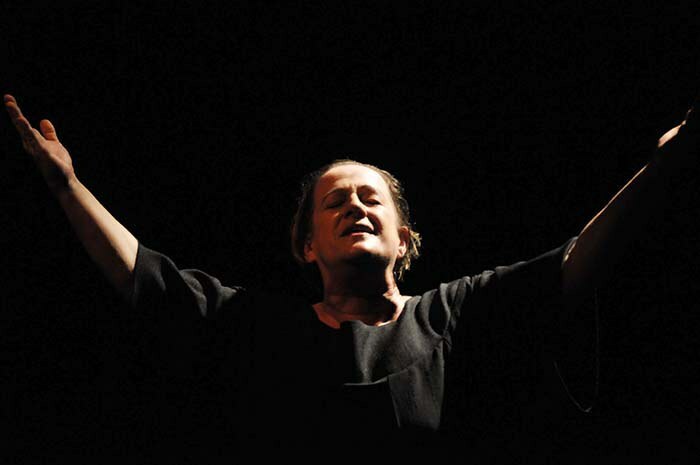 Beyond one’s immediate admiration for the mnemonics of actors, the play’s overall attention to elocution – which was remarkable in the performances of Lourinelson Vladmir (book 3) and Patricia Reis Braga (book 22) – attests to the heralds of a particular type of contemporary theater that a naturalistic colloquialism is not the inexorable fate of theatrical language. Costumes were all black and discrete, against a black backdrop, without any explicit chronological dating, converting the exposed body parts of actors – heads, mouths and hands (in some cases, also their arms) – into fragments of sculptures of an ancestral memory. As to music, only words and silence were to be found. There were no incidental themes underlining particular meanings and attempting to manipulate spectators affectively. Viewers were left to a comfortable (and rare) freedom. Crowning the formal diligence of the scene, Beto Bruel’s lighting not only produced vivid pictures with varied colors and intensities; above all, it rigorously marked the transitions between narration and dialogue parts of the text, always clearly evincing who spoke: the narrator or one of the hundreds of characters who voiced out the lines of The Iliad (for instance, only in book 24, presented by Andressa Medeiros, one finds 119 changes of speaker – followed by 119 shifts of lighting). Thus, lighting appears as a scenic element to link all other elements and promote a happy marriage between the senses and meaning. Eric Auerbach’s famous essay, “Odysseus’ Scar” (AUERBACH, 1996, p. 3), shows how Homer’s poetry is characterized by the Apollonian impulse to make everything visible and not let anything remain hidden or unexpressed, zealously marking the limits and distinctions between things, men and the gods. In this sense, project Ilíadahomero as a whole is profoundly Homeric, as it gives its spectators the opportunity to ‘see with the ears’. This means the opportunity to allow oneself to be led by the musical flow of a language at first difficult to follow without the scenic and dramatic references that would be necessary to maintain one’s desire to continue listening. Such desire, it is worth repeating, did not survive as I first attempted to read Odorico Mendes’ translation of The Iliad. The fact that Octavio Camargo did not adopt an “easier” translation of The Iliad bears proof of his project’s radical nature: understanding in theater is connected above all to a type of listening that respects the necessary time for internalizing what is heard, in all its strangeness, and not to a prompt decoding that converts the strange into familiar without promoting a transformation in the hearers. The proposal to stage a 24-hour show makes clear the intention to transmit truly meaningful experiences and to be useful for our practical lives – in Camargo’s words, “the past is our compass”. And the fulfillment of this potential hinges on the opportunity of a direct contact with the original works. Only from a vivid contact may love – which is not given naturally and immediately – emerge. As Alan Badiou shrewdly stated, love is less a result of the randomness of an encounter than of the dedicated work to make it endure and to eternalize it (BADIOU, 2009, p. 41). As the 16-year-old gestation of project Ilíadahomero proves, it all depends on the possibility that we may learn anew an ability that has been poorly valued by modern man: namely, the ability to ruminate. In the formal decisions of the play’s direction regarding the arrangement of scenic elements on stage, along with his option to use Mendes’ translation and the task of restoring us the entirety of Homer’s poem, Octavio Camargo clearly demonstrates a rare respect for the intelligence of his spectators. As he does so, he sails against the tide of the directors who are continually willing to compromise elements in the attempt to simplify or update the language of the classics, while creating exquisite effects to appease an audience that they see as “costumers”. Behind their apparent generosity, lies a pernicious assumption that the audience is stupid, which serves precisely to feed stupidity and creates a vicious circle that has engulfed a considerable part of the current productions. On his turn, Camargo makes it clear that the artist’s task is to create a relation with his object capable of revealing it under a new light, without letting oneself be clouded by any expectation regarding its always unpredictable reception. In the case of project Ilíadahomero, this “new light” was literally present: with Beto Bruel’s precise shifts of lighting, it became concretely clear to me how much Homer is essentially a dramatic poet (even better: how much his work contains the seeds of the future, inasmuch as it includes a combination of the epic, lyric and dramatic genres, therefore anticipating Berthold Brecht and the so-called “postdramatic” theater). It also showed me how much the contact with Homer’s poetry depends on its oral transmission. Thus, theater is valued as a privileged locus where poetry is immortalized, while also immortalizing theater itself, against the catastrophists who insist to see it as “an invention without a future”. When Camargo presented the ten books of The Iliad in Curitiba, he used the fact that they were a “sample of the process” to step up on stage before the beginning of each book and narrate its storyline in a colloquial and humorous language. Taking advantage of the prerogatives of an informal approach to his classic theme, Camargo did not restrict himself to simply narrating the plot of each book, but he also carefully explained the origins of project Ilíadahomero and the ideological principles that guided its birth. From the vast wealth of information provided by Camargo to the public in his prologues, two points deserve to be highlighted. The first point is a possible analogy between the somehow vernacular Portuguese translation of Odorico Mendes and Homer’s Greek. As Camargo emphasized, for the audiences of the classical era in the 5th century B.C, Homer’s Greek had already become a strange and ancient language removed from ordinary speech. In this sense, the historical distance between Homer’s Greek and the Greek of the classical era is analogous to our own historical distance to Odorico Mendes’ language. Thus, the adoption of Mendes’ translation with a classic ‘flavor’, instead of a more modern translation, has an additional advantage beyond its intrinsic poetic strength, namely the capacity to transport us into an atmosphere similar to that of the customary audiences in the days of the great Homer Contests. The large crowds who attended those contests, in contrast to us, did not feel embarrassed by the linguistic difficulty of the poems. This was a consequence of the fact that since childhood, they had contact with the language of their great poet. Habit and cultural familiarity with a poet who by that time was already a “classic” and somehow “erudite” actually made him popular, despite his complexity. It is possible to extract a valuable lesson from this finding: there is not an intrinsically difficult work, just like there is not a language that one cannot learn. Octavio Camargo frequently mentioned the Chinese children, who can perfectly master a language that seems almost impossible to us. It is all, then, a matter of contact and access. From this perspective, the issue of education for and by poetry acquires a new dimension: instead of wasting our time thinking about strategies to facilitate things, it is necessary to cultivate a public familiar with the fact that in the case of the true works of art, we need to proceed as learners of a foreign language without a dictionary. The more frequently we are exposed to this language in its own terms, the more capable we will be of grasping it, and, thus, of enjoying it. In essence, therefore, the dispute between erudite and popular formats, or between, so to speak, experimental theater and commercial theater, can neither be decided in objective (which type of theater would be inherently better), nor in subjective (which type of theater do people prefer) terms. Instead, it is to be decided in political terms: the more the State can secure access by the public to more demanding works (from the formal standpoint), the less these works will be subjectively experienced as impenetrable. Thus, at some moment, the divide between erudite and popular works will stop making sense. Only in this indirect way would the idea of “popularizing the classics” be laudable. For in this case, the direct paths available would necessarily mean a debasement both of the classic works and of their possible audiences. The second valuable point is intimately linked to the first one. It regards the recognition – by the Greeks themselves in the classical days – that habit, by itself, is not enough. Such recognition is linked to the functions of a rhapsode. The rhapsode was a leading figure of the Homer contests, who attracted large crowds to the theaters, and was also a performer in its most contemporary sense – in short, a pop star. The immortal rhapsode Ion, from Plato’s dialogue, was frequently cited by Octavio Camargo in his prologues. In Greek culture, a rhapsode was an interpreter of epic poems, who knew them by heart. He was a proto-actor who played all roles, and he also served as an explainer of the more obscure passages of the poems for audiences who were already distant in time from their original sources. For this reason, rhapsodes became closely associated with the sophists, and, as such, they were also a target for Plato’s attacks. In the Ion dialogue, Socrates seeks to demonstrate that rhapsodes, precisely on account of their alleged virtue of “divine possession”, were capable of producing beautiful discourses but did not hold the knowledge of what they spoke. This accusation becomes quite serious if we consider that as interpreters of the epic poems and, above all, of Homer, the “first teacher of Greece”, they were largely responsible for educating the people – a position that was then aspired to by the nouvelle vague of a new generation of philosophers. Whatever was the context of the disputation between Plato, the sophists and mimetic poets, the fact is that during the classical period in Greece, when Homer’s language already sounded distant, his “interpretation” did maintain two complementary meanings: Homer was interpreted both in the theatrical and musical senses of the word, that is, as an updated performance of a previously existing work and also as an interpretation in the sense of an explanation. This second meaning, beyond the scenic show, presupposed the awareness, by artists, that the level of consciousness of their audiences required some form of discursive mediation capable of empowering the reception of the words of the poets. I have been emphasizing Octavio Camargo’s esteem for the intelligence of his audience as he refused to resort to any procedure that could reduce the complexity of Homer’s text when staging the 10 mentioned books of The Iliad, thus giving viewers a chance to experience the strangeness of a classic work in its own terms, with a stage setting that was as Apollonian as Homer’s poetry itself. Yet, it is a curious and noteworthy fact that at least in the presentations of the Curitiba Festival, Camargo actually felt the need for a previous discursive mediation of the books of The Iliad. 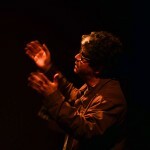 If we consider the classical rhapsode figure as a model, then Camargo’s strategy was possibly to take chances in the sense of dividing the rhapsode’s task into two parts: the actors were responsible for interpreting the text as a theatrical performance, while he personally interpreted it by means of discursive interventions. The contrast between the two styles evidently stands out as one compares the strictness of the theatrical performance, on the one hand, to the friendly informality of its director’s explanations, on the other. In my opinion, since Ilíadahomero is still a work in process, two opposed suggestions seem to be in order. Camargo should either hold to his rhapsodic impulse, in the sense of building for himself a setting capable of accommodating his prologues in a more rigorous way; or, conversely, while satisfying the same rhapsodic impulse, and perhaps mimetizing the twofold effort of ancient rhapsodes, the actors themselves should carry out the responsibility of a discursive mediation of the more intricate aspects of each book. In any of these cases, one thing seems certain: in contemporary stagings of Homer, it is extremely desirable to invest in a revival of the rhapsode figure, in order to encompass both aspects of the rhapsode’s original function. Bearing in mind the laudable resolution to adopt the translation of Odorico Mendes, the two complementary halves of this function point at a critique that will not restrict itself to immanent issues of scenic options. Instead, such a critique would be at once unafraid of a more casual discursiveness – remaining, thus, closer to the language of the present – and capable of assuming that when approaching the classics, the autonomy of a work of art is not wounded by the explicit inclusion of a critique of the source text. Such inclusion cannot be confounded with contemporary metalinguistic facilitations, and must still be invented. If there is a Brazilian director who does have the necessary tools for a mature reinvention of the rhapsode figure, such director is Octavio Camargo. ADORNO, T. “O ensaio como forma” [“The essay as form”]. In: Notas de literatura I. Tradução de Jorge de Almeida. São Paulo: Duas Cidades, ed. 34, 2003. AUERBACH, E. “A cicatriz de Ulisses” [“Odysseus’ scar”]. In: Mímesis: A representação da realidade na literatura ocidental. São Paulo: Perspectiva, 2001. BADIOU, A. Éloge de l´amour [In praise of love]. Paris: Flammarion, 2009. BARTHES, R. “O que é a crítica” [“What is criticism?”]. In: Crítica e verdade. Tradução de Leyla Perrone-Moisés. São Paulo: Perspectiva, 2013. BENJAMIN, W. “As afinidades eletivas de Goethe”. In: Ensaios reunidos: escritos sobre Goethe. Tradução de Mônica Krausz Bornebusch, Irene Aron e Sidney Camargo. São Paulo: Duas Cidades, Ed. 34, 2009. DELEUZE, G. “Um manifesto de menos” [“One manifesto less”]. In: Sobre o teatro. Tradução de Fátima Saadi, Ovídio de Abreu e Roberto Machado. Rio de Janeiro: Jorge Zahar, 2010. HOMERO. Ilíada. Tradução de Manuel Odorico Mendes. Cotia, SP: Ateliê editorial; Campinas, SP: Editora da Unicamp, 2008. HOMERO. Odisseia. Tradução de Manuel Odorico Mendes. São Paulo: Edusp; Ars Poetica, 1992. ISER, W. O ato da leitura: uma teoria do efeito estético (vol. 1). Tradução de Johanes Kretschmer. São Paulo: Editora 34, 1996. NANCY, J-L. “Le partage des voix”. In: Ion. Traduction par Jean-François Pradeau. Paris: Ellipses, 2001. NIETZSCHE, F. “Zur Genealogie der Moral”. In: KSA, Band 15. München: Deutscher Taschenbuch Verlag; Berlin/New York: de Gruyter, 1993. PLATÃO. Íon. Tradução de Claudio Oliveira. Belo Horizonte: Autêntica, 2013. SARRAZAC, J-P (Org.). Léxico do drama moderno e contemporâneo. 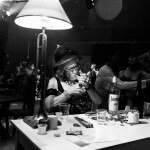 São Paulo: Cosacnaify, 2012. Patrick Pessoa is professor of the Department of Philosophy, Federal Fluminense University (UFF), critic and playwright. English translation by Dermeval de Sena Aires Júnior. Dermeval is 39, married, and lives in Brasilia, DF, Brazil. He holds a degree in International Relations (UnB) and an MSc in Strategic Studies & Philosophy (UFRJ). He has lived in the USA and Germany, and works as interpreter, translator and proofreader of Portuguese, English and Spanish since 2005. The 10 books staged in Curitiba were the following: Book 1, by Claudete Pereira Jorge; Book 3, by Lourinelson Vladmir; Book 7, by Helena Portela; Book 8, by Célia Ribeiro; Book 13, by Kátia Horn; Book 14, by Eliane Campelli; Book 15, by Regina Bastos; Book 16, by Richard Rebello; Book 22, by Patricia Reis Braga; and Book 24, by Andressa Medeiros. Considering the relative autonomy of each staging, it would be much more interesting to undertake detailed analyses of each book, highlighting their similarities and differences. However, such task would exceed the scope of this essay. The title of this essay dialogues with Jean-Pierre Sarrazac’s concept of rhapsody, which is described as “a concomitant refusal of Aristotle’s ‘beautiful animal’; a kaleidoscope of drama, epic and lyric genres; a constant inversion of high and low points, of tragic and comic; a collage of theatrical and extra-theatrical forms, giving shape to a mosaic of the written word in a dynamic staging endowed both with a narrative and questioning voice, which is a result of an alternately dramatic and epic (or visionary) subjectivity” (SARRAZAC, 2012, p. 152, in free translation). Yet, despite this inescapable citation of the greatest active theorist of theater, I followed a fruitful indication of Jean-Luc Nancy and added more emphasis to the ambiguity of the figure of “the rhapsode as interpreter”: that is, the rhapsode at once as an actor and an explainer of works, whose hybrid nature Nancy strives to expose.